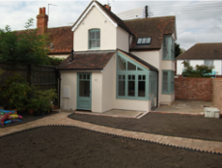 Roy Passey Builders are a well established company based in Benson, Oxfordshire, and have been trading since 1974. Our aim is to provide unrivalled first class quality workmanship and a cost effective service to all of our valued customers. We have a team of skilled carpenters, bricklayers, plasterers, painters and decorators. We are also able to offer the services of long established and highly recommended electricians, plumbers and tilers, etc. We pride ourselves in having a friendly and reliable work force who are there to ensure that your job runs smoothly.